Goggle Beanies On Sale NOW! 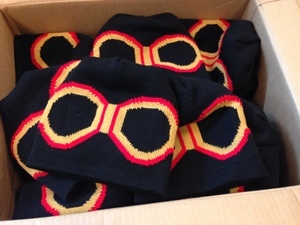 Our BRAND NEW Goggle Beanies are on sale NOW for $20.00! You can order yours by calling us at 515-633-2255 or stopping by our front office! Our office is open week days from 8:30am-5:30pm. We have a limited amount available so order yours today! Please note: There is a $5.00 shipping fee. SEASON TICKET HOLDER PERK: Season Ticket Holders get a 10% discount on all Barnstormers merchandise! Season Tickets for the Barnstormers 2014 season are on sale now for as low as $110 per seat. Don't miss a minute of the action this season! For more information call the Barnstormers at (515) 633-2255 or log on to http://www.theiowabarnstormers.com.